This promotion may have already started but there is still plenty of time to join in, it will run until the 11th of April. 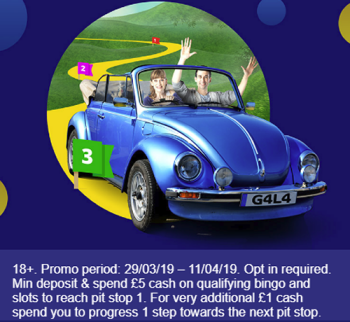 All you have to do is log in to your account and opt in to the promotion, deposit and wager £5 on bingo tickets in the City room or Gala Gold games and that’s it. For every extra £1 that you wager in the City room or Gala Gold games, you will move forward on space on the pit stop map. Qualifying weeks will run from Fridays to the following Thursday, these games will be played in the City room, the free bingo will be played in the Pina Colada room on the Saturday. Pit stop 1- a share of £6,000 of free bingo games, where you will pay for 1 line,, 2 lines and the full house. £1,000 will be shared on players who don’t win a prize. Reach pit stop 2 and you will receive 10 free spins which can be used on Fishin’ Frenzy, Legacy of Ra Megaways, Primal Megaways and The Goonies. A share of £2,000 in cash when you reach pit stop 3. Pit stop 4 will see players get a share of £3,000 in cash. £5,000 in cash will be shared amongst players who reach pit stop 5.